The new Sea World Culture and Arts Center, China's "first major design museum" is the result of an important pioneering international partnership between leading state-owned company China Merchants Shekou Holdings (CMSK) and the Victoria and Albert Museum (V&A), the world's leading museum of art and design based in London. The museum and cultural hub in Shenzhen opened to the public in December 2017 and includes a permanent gallery space curated by the V&A. The museum promotes Chinese design to an international audience and presents the best international design in China. The Victoria and Albert museum lends objects and tours exhibitions to the Shenzhen museum. The Mountain View Theater is a 328-seat auditorium that marks the crown of the Sea World Culture and Arts Center. With views overlooking Nanshan mountain, a third-floor foyer opening up into a terrace, and a fourth-floor foyer overlooking the roof garden, the theatre hosts lectures and performances. The theatre is enclosed by a double-skin with exterior louvres, allowing views of the city and mountain from inside. 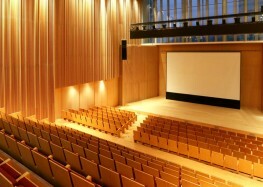 To complement the clean lines of the building's design, the contemporary wooden back and outer ISI seat were chosen. The ISI has a narrow envelope and a high back and this is the first completed installation of this product.